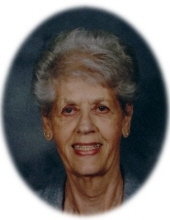 Nancy Childs Hohman, age 92 of Berkley, passed Wednesday, January 16, 2019 at Abbey Park at Grand Blanc. She was born January 2, 1927 in Farmington to Robert and Dorris Ferguson. She is survived by her children, Ruth A. Hohman and John (Dawn) Hohman; and grandchildren, Jewel, Erik, and Anthony. Preceding her in death are her husband, John W. Hohman (2010), whom she married October 4, 1947 in Detroit; her parents; and her siblings, Robert, Maureen, and Katie. The family will receive friends Monday, January 21 from 4:30 PM until the time of service 7:00 PM at the Sawyer-Fuller Funeral Home, 2125 12 Mile Road, Berkley (two blocks west of Woodward Avenue). Private burial at Acacia Park Cemetery in Beverly Hills. Memorial Contributions may be made to the Judson Center, 4410 West 13 Mile Road, Royal Oak, Michigan 48073. To send flowers or a remembrance gift to the family of Nancy Childs Hohman, please visit our Tribute Store. "Email Address" would like to share the life celebration of Nancy Childs Hohman. Click on the "link" to go to share a favorite memory or leave a condolence message for the family.